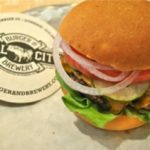 “Eat Pasture Raised Beef, Drink Fresh Beer.”- Bull City Burger and Brewery Bull City Burger and Brewery is located in downtown Durham, NC. Our beef is local pasture raised with no added hormone and antibiotic free. We source as many local ingredients as possible to make everything from scratch. We are Back to Scratch.